What Happened on the Fifth of May? France invaded Mexico supposedly to collect debts. The Mexican people fought for their freedom and to protect their land. Even though the French had more soldiers and supplies, the Mexicans fought hard and defeated them. The important Battle of Puebla was fought May 5, 1862. Even today Mexicans and Mexican-Americans celebrate the courage of the soldiers. It is a wonderful celebration filled with pride for their descendants. Depending upon the abilities of your students, you may have them do these individually, in pairs or small groups. Juan has three bags of candy to fill a piñata. Each bag of candy has fifty-three pieces of candy. How many pieces of candy all together? Students collected hats to do hat dances. They have three hats with flowers, six hats with ribbons, two each of red hats and yellow hats. How many hats in all? 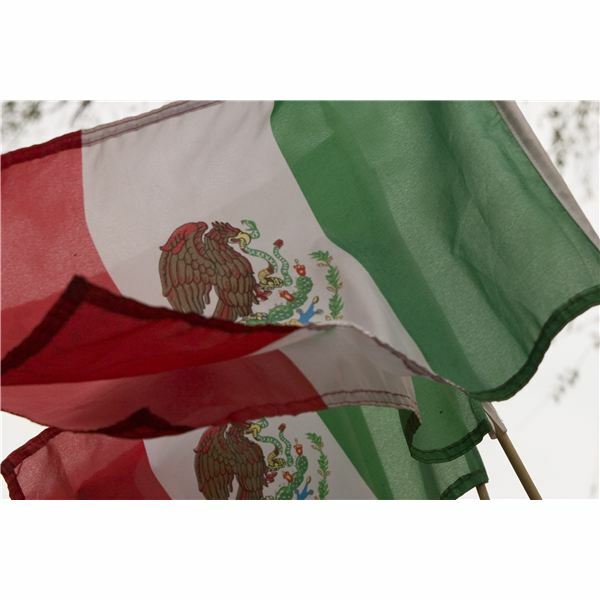 Mexico won the Battle of Puebla against the French in 1862. How many years ago was that? Mexico won the battle on May 5th or Cinco de Mayo in Spanish. Name the months with the same number of days as the month of May. One part of the Cinco de Mayo celebration is eating! There are twenty-two members of the class. If each person in the class eats three fajitas, how many fajitas will we need? It takes one pound of ground beef to make eight tacos. How many can we make with five pounds of ground beef? Juan took five swings at the piñata. George swung seven times and Pedro swung four times. Maria took three swings and broke the piñata! How many swings were taken at the piñata? The French had 1,438 soldiers in the battle. The Mexicans had 873 soldiers. (Not accurate numbers of soldiers) How many soldiers were in the battle in all? How many more soldiers did the French have? There are three groups of dancers in the Cinco de Mayo parade. Each group had a dozen dancers. How many dancers are in the parade? Each pound of ground beef costs $2.40. Each package of twenty fajitas cost $3.59. We bought five pounds of ground beef and two packages of fajitas. How much did we pay? How much change did we get back from a twenty dollar bill? Four bands played at the celebration. Each band played for 20 minutes. They started at 1:00 pm. When did the last band finish playing? The battle lasted four hours. How many minutes is that? A parade float measures 18 feet long and 10 feet wide. Have your students measure that length and mark it with masking tape to visualize how big the float is. Put pinto beans in a large jar. Have the students each take a guess at how many beans are in the jar. Then pour the beans out and have students count out piles of 10 beans. Then count by tens to find out how many beans were in the jar. Ask for the help of parent volunteers or students can be assigned items to bring in for the fiesta. Bring in a crock-pot full of prepared taco meat. Use this for a yummy measuring activity! As students prepare their fajitas/tacos have them measure lettuce and cheese with the 1/4 cup, tablespoon for the salsa and food scale to measure 3 or 4 ounces of meat. Math Activities for Cinco de Mayo can enhance your study of this Mexican holiday. It includes problem solving, measuring, counting and eating! Learning can be fun.